So basically, I went to the farmers market and then turned my purchases into a pizza. The herbs, garlic, cheese, vegetables and eggs are all locally-grown and fresh. If you’re avoiding dairy, the cheese can easily be omitted—it’ll be just as delicious. 1/2 cup grated white cheddar or mozzarella cheese $3 for 8 oz. Preheat oven 475 degrees F. Lightly dust a baking sheet or pizza pan with flour and set aside. Place herbs, olive oil, garlic and almonds in a food processor or blender and puree into a slightly chunky pesto. Season with salt and pepper to taste. To shave the asparagus, lay a stalk on a cutting board and carefully run a vegetable peeler over the length of the vegetable, creating a thin strip. Continue until all that is left is as thin strip of asparagus and repeat with remaining asparagus. Set with other pizza ingredients. On a lightly floured surface, use a rolling pin to roll pizza out into a 12" circle. Transfer to prepared baking sheet. Spread pesto over base of dough, leaving a 1" border. Sprinkle with cheese. Crack eggs over cheese. Top with shaved asparagus and tomato slices. Bake for 10-12 minutes or until crust is crisp and browned on the edges. Sprinkle with red chili flakes, if desired. 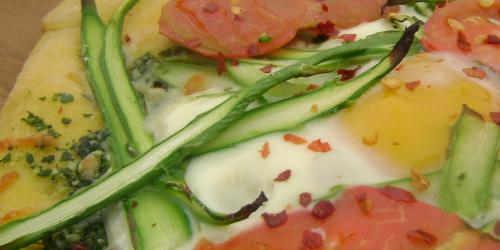 I have read very interesting topics on herb pesto pizza with shaved and fresh eggs. The details are really much interesting to have new stories for ukbesteessay service article follower and they are much happy with the news articles. Great job, I can not wait to visit this site for the essay topics and more interesting topics always with GRADEminers real review. More updates always about great concepts and more college paper services always,thanks for sharing. I was cheerful to locate your obvious technique for making up the send. Currently, you make it tidy for me to perceive and support the idea. a financial debt of gratefulness remains in order for the arrangement.